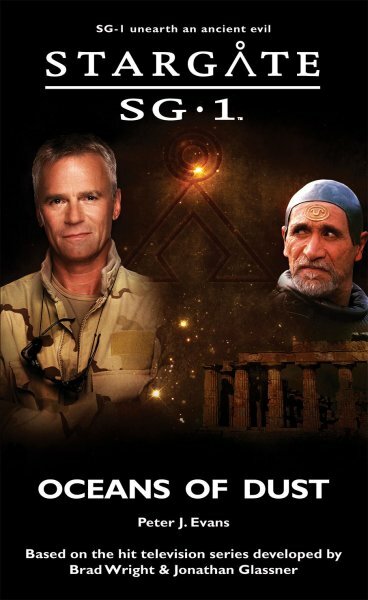 When disaster strikes an Egyptian dig, SG1 are brought in to investigate. But nothing can prepare them for what they find among the ruins. Walking in the dust of a thousand deaths, they discover a creature of unimaginable evil - a creature the insane Goa'uld Neheb-Kau wants to use as a terrible weapon. "DEATH GLIDER." It was close enough now to be unmistakable; a glossy crescent howling down out of the sky towards him. As soon as he had spoken the machine unleashed its energies a second time; O'Neill saw gouts of fire spitting from its cannons. He dived for cover, throwing himself behind a boulder. There was a whiplash impact as a shot hit the rock, an earsplitting din of frozen stone superheating and exploding away in lethal shards, and bolts of fire were ripping past as the glider fired over and over into the plateau. O'Neill felt the punch of each blast through his boots, through his bleeding hands as he crouched. A shadow crossed him, viciously quick, as the glider hammered through the air over his head, and he heard the electric whoop of a staff weapon as Teal'c sent darts of energy lashing up into the sky. A shot connected, spattered uselessly off a wing. The glider flew level for a second or two, then rose into a smooth, almost vertical climb, accelerated into a blur. In a heartbeat it was lost to the clouds. "Damn," muttered O'Neill, getting up. He was starting to hurt all over. "That turned up fast."